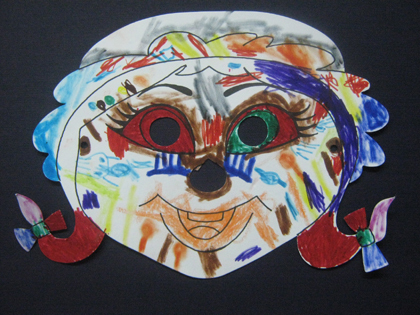 D: It’s a witch mask I made at Vikki’s for you – there’s a coloured bit of the witch’s eye, with blood round it. The other eye is just BLOOD! There’s some sweets to eat [all over] and that’s a spider [left cheek]. They’re spikes on her nose. This entry was posted on Saturday, September 15th, 2012 at 7:05 pm and is filed under Uncategorized. Tagged: art, blood, causing offence, mask, spider, sweets, witch. You can feed this entry. You can leave a response, or trackback from your own site.